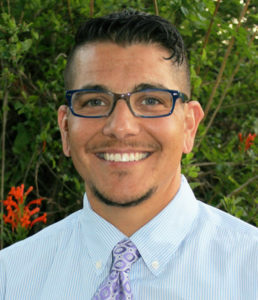 Aydin Olson-Kennedy, MSW is the Executive Director of the Los Angeles Gender Center where he provides psychotherapy for gender non-conforming and transgender youth, adults and their families. Before moving to Los Angeles, Mr. Olson-Kennedy founded he Community Counseling Program in Chico, CA aimed to increase affirming mental health care for uninsured/underinsured LGBTQ youth and adults. In 2014, Mr. Olson-Kennedy was hired by St. John’s Well Child and Family Center to create a transgender health program. During his tenure, he grew the program from 10 patients to over 400. For the last 15 years he has spoken across the country on the importance of informed consent mental and medical health care for gender non-conforming and transgender individuals, with emphasis on identifying and acknowledging domains of privilege. He recently talked to guest blogger, Nathan Tabak, about his practice and about his workshops at both Gender Odyssey conferences, in Seattle and Los Angeles. What subject are you presenting on? I am co-presenting at multiple workshops on trans children and teenagers, including “Just a Boy/Just a Girl,” two sessions of Gender Google for parents of children and teens, “Car Talk” and “Under the Microscope.” These workshops will explore the symptoms of gender dysphoria, and the ways it can manifest beyond physical discomfort, offering ways to help parents, educators, and others better equip themselves to work with and care for transgender and gender-nonconforming children and teens. “Just a Boy/Just a Girl” will examine the very present theme of younger trans people, who are often dissociating themselves from a trans identity and instead identifying solely as their own gender identity – i.e. simply a girl, as opposed to a trans girl. What does that mean for the trans youth who are transitioning in childhood, their families, and for those who work with trans people? After all, there will be times when a trans identity is difficult to escape. In these workshops, I emphasize practicing informed consent, as opposed to the more traditional role of gatekeeper. Historically, the prerequisites for transitioning have been very strict, with stringent therapy requirements for proving your gender identity in a very cis-normative, hetero-normative way. This left very little room for a more diverse narratives of trans lives and experiences. While often well intentioned, these strict requirements have the effect of further pathologizing trans folks. This is basically the model that was created for adult trans women with financial resources, and thus does not speak to the entirety of the trans community. Sometimes, we place too much of an emphasis on therapy being used as a way to make everyone else around the trans person comfortable, which has the unfortunate effect of decentering the trans person. I’m very much pro-therapy, if and when someone wants to seek it; we just need to be more thoughtful and strategic in how we use it. My role is to accompany them on their journey, even when that leads them to decide that transitioning isn’t right for them. What main takeaway would you like to see attendees of your presentation come away with? I would like parents and providers alike to come away with a broader understanding of gender dysphoria, beyond the implications of gender-confirming surgery. For instance, if you’re a trans man, chest surgery won’t end gender dysphoria; it’s important to understand that this is a long-term process that ebbs and flows over time. Finally, as a trans person, I appreciate Gender Odyssey’s commitment to putting trans people front and center, giving attendees and clinicians an opportunity to learn from us. The landscape of transcare is changing and there are more trans professionals than ever before. This gives attendees a broader perspective on the lived experiences of trans and gender-nonconforming individuals. In a climate of unprecedented visibility and new challenges confronting our community, what makes your topic particularly relevant? There’s no question that with the current administration, people are feeling more nervous, anxious, and uncertain. The discriminatory rhetoric has definitely impacted my clients and their loved ones. Although many of the policies being put forth my this administration haven’t directly impacted the community, that could change depending on what happens in health care. That said, there’s no doubt that trans and GNC folks in other states and even other parts of California are experiencing much worse, particularly from discriminatory education around bathroom access. What do you hope to take away from this year’s conference? One of the major reasons I’m excited about the LA conference is its diversity. When I look at the schedule, I’m happy to see POC voices so well represented; too many other conferences I’ve been to have been a sea of white people. It’s so important for me to learn from the experiences of trans people of color. What happens in NC [for instance] may not directly impact me in CA, but connecting with the community across state and color lines is. Do you have any additional thoughts on this year’s conference or the state of the trans community to share? I’m excited and hopeful that other mental health providers will attend and feel compelled to do this work. The LA Gender Center receives over a dozen calls a week from folks seeking affirming mental health care. Ideally, we would have a robust referral base to assure trans folks and their families are supported. Attending conferences such as GO LA and GO Seattle is vital to the ongoing development of mental health providers. These conferences are game changers for the community. Mr. Olson-Kennedy earned his Bachelor’s degree in Social Science, with an emphasis on Social Work, Sociology and Multi-Cultural and Gender Studies; and his Master’s Degree in Social Work from California State University, Chico. He is a member of the National Association of Social Workers (NASW) and the World Professional Association of Transgender Health (WPATH). Recognizing the need for mental health services, he co-founded the Stonewall Alliance Center Community Counseling Program in Chico, California, a program developed to provide no-cost/low cost mental health services for LGBTQ youth and adults. He is also a co-founder of the Transgender Task Force at California State University, Chico. This entry was posted in Blog and tagged Children, Conference, GO2017, Olson-Kennedy, providers, Spotlight, Transgender Child. Bookmark the permalink. 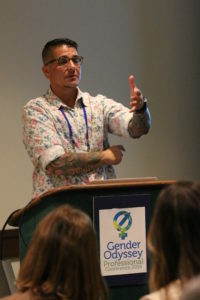 Gender Odyssey is an international conference focused on the needs and interests of transgender and gender diverse children of all ages, their families and supporters, and the professionals who serve them. Gender Odyssey is produced by Gender Diversity and TransFamily Support Services. Learn more about Who We Are and Our History.